Posted on 16/2/2019, 11:17 am, by Colin Charles, under Tech. I landed in London sometime in January 2019, and made an appointment at the Regent Street Apple Store the same morning for that afternoon at 1pm. This is apparently a very rare thing, because Apple Store appointments are usually full up weeks in advance. The reason was simple: my 2016 15” retina MacBook Pro was starting to wobble at the base and the battery indicator did say it was time for a service. This battery for what it is worth has only done under 200 cycles, so it did seem odd. The wobbling suggested that the battery possibly had expanded, and this was also affecting my use of of some keys — notably the left shift key, and on the right side the ? Key (it would many times skip giving me ? But instead give me /). I arrived for my Apple Store appointment a little early and was told that I could only check in at 12:50pm. Fair enough, I would just wait it out at the store. The Genius Bar was packed full. I was finally told to take a seat upon checking in and a genius would be with me shortly. I met a friendly genius, who told me that it is likely the battery expanded and they would have to change the whole top cover as this was all integrated, meaning I would also get a new keyboard. Then he said that I would need to typically leave it there for up to 7 days, but since I was travelling all around, they would try to do it within 24 hours. As luck would have it, they did not have the parts available in store, and then checked stock to see that Covent Garden had 2 units. Upon calling, they would take 2 weeks (yes, a whole 14 days) to fix it. This was unacceptable. The genius wrote up a report about how they were willing to do it at Regent Street and how this was odd that Covent Garden would not in a timely fashion; he also encouraged me to get this fixed ASAP as it was not a good idea to continue using said laptop. This is great news to hear when travelling, clearly. So it is clear: Apple laptops are still not made for Enterprise use. Fast forward a couple of weeks later and I order a Mac Mini to my home in Malaysia. I figure it is a computer I have wanted to get for sometime and I would use a desktop for the one week or so that I would be in town. I make a Time Machine backup of my MacBook Pro, and restore it to my 12” MacBook (2016) that I have not sold from a previous engagement. The restore takes many hours, and when it is finally done, the one thing that I consider quite important — Mail — is not fully migrated. All the local folders are not converting, and maybe this is a Mojave bug (I was coming from High Sierra). So I am thankful to start exporting Mail in the MBOX format. In addition, Chrome seemed to be missing all the plugins that I had installed, so this was further manual work. This leads me to believe that when I do setup the Mac Mini and also when the MacBook Pro comes back from a service, I will set it up fresh (or hopefully, the MacBook Pro just needs an update, and the data remains intact; this is apparently true according to the genius — nowadays Apple does not even ask for your password any longer). After all, I do have iCloud sync turned on (so Keychain is synced), Dropbox seems to be doing more work than expected, and passwords are managed in 1Password. I’ll have to sync my Mail manually, which seems like some bandwidth will be used, but that seems fine. But maybe I won’t be needing all the applications that I have. And what about my home directory? (The Linux advantage is just moving your home directory; I am uncertain if this is true with macOS as I have always relied on Time Machine). Today I visited the service centre. I’m told that it would be there possibly for the 7 day period, so I may be able to get it back next Saturday. If this were my only Mac, I would be out of commission for a whole work week. If I had purchased a Dell or a Lenovo, I would have all this fixed by the next business day. Alas, I am still “locked into” macOS. Initial Mojave thoughts? Kind of silly that when I fire up Terminal I can’t even do a ls in ~/Library/Mail unless I give Terminal all disk access. What a mess, all this lockdown is, if you ask me. Posted on 7/10/2017, 5:41 pm, by Colin Charles, under General. Today I uninstalled CrashPlan on my macOS laptop since on August 22 2017 they announced they were exiting the home user market. I think the party is close to being over as even Amazon CloudDrive is now limited to 1TB of storage. I wanted to ensure I removed any traces of CrashPlan. I use the locate command a lot. Ever wondered how to run the equivalent of updatedb on macOS? Its locate.updatedb (comes with a man page too). Run sudo /usr/libexec/locate.updatedb and that updates the locate database. Pleased to say CrashPlan went away quite cleanly. Posted on 7/10/2017, 4:00 pm, by Colin Charles, under General. I like the concept of Keybase, have had an account there for sometime (https://keybase.io/bytebot). I also installed the Keybase app on macOS which has kbfs, the FUSE-based filesystem for Keybase users to share files with encryption (read more). However, I also tend to spend time offline, and sometimes on restricted networks where I use TripMode. I realised very quickly that a simple ls or df could take some 20 seconds to complete (timeouts at work). I used to have to also unmount the /keybase directory but this seems to be taken care of by newer clients. A macOS annoyance. I can’t always just have it running. There is a github issue #971. I think their iOS app is quite well done and have no complaints thus far. 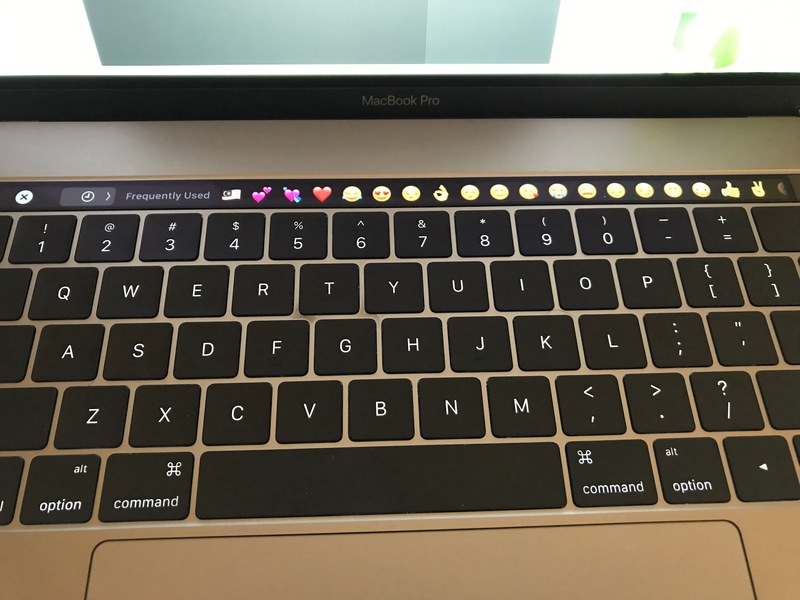 The Touch Bar can wow you over! Posted on 5/6/2017, 1:22 am, by Colin Charles, under Tech. In the tech space, sometimes people can be notorious for bemoaning new technology. Case in point? The Touch Bar on the new retina MacBook Pro’s. I’ve been using a 15″ retina MacBook Pro with Touch Bar for about six months now. I am a vim user when I SSH to servers so I do use the Escape key (and maybe find it a tad annoying that I don’t get any feedback that I’ve hit the Esc key). Otherwise, I use BBEdit. I’ve used the function keys to control screen brightness, adjust volume, and play music. I don’t find Siri useful. I’ve wondered why when I use Keynote I can see little slides appear on my Touch Bar (not like I can read the text, right?). Safari has always been odd with switching tabs via a keyboard (unlike Chrome’s shortcuts), but now you can also switch tabs using the Touch Bar (alas, I’m not really a Safari user). PDFpenPro has selection tools that I can now access via the Touch Bar, so its a bit of a productivity improvement. So all in, I’m more or less indifferent to the Touch Bar. I don’t love it, but I don’t hate it. Oh wait, I can’t forget the killer feature: unlocking my MacBook Pro with my fingerprints! Touch ID is a killer feature especially since I use 1Password which also supports it. I think this feature alone has improved my productivity tremendously, and saved lots of time re-entering my password. However, Sara saw my keyboard the other day and she was amazed that it could also display emoji. And this made her really like the MacBook Pro’s Touch Bar (she’s a 13″ MacBook Air user). So Apple can wow users! I presume she will find other uses for it as she’s a creative user of the Mac. I’m just a boring text/code wrangler.